What’s your favorite Girl Scout cookie? Everyone (living in the US of A) has one. Thin Mints, Samoa, Tagalongs, Lemon Chalet Cremes…. ? My mom’s favorite is the Thin Mint. Subtle mint flavoring covered in chocolate deliciousness. Yes please! 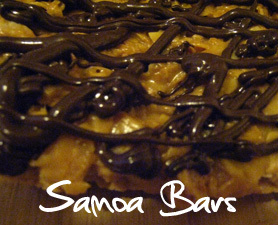 But I have grown to love Samoas and Tagalongs just as much (if not a little more). In fact, and I hate to admit this, I would inhale boxes of them in college. Because really – Girl Scout cookie-time comes but once a year. I gave up my box-a-day habit many years ago but, each Spring when I get accosted by little girls in uniform, I secretly long for a tray of Samoas. This year I gave in, but not as I had previously imagined. I decided to try making my own. A quick Google search lead me to BakingBites.com’s Homemade Girl Scout Cookies and a grocery list was quickly assembled. A couple of notes: do not cheap out on ingredients with this dessert. Look for unsweetened, shredded coconut and the best dark chocolate you can find. 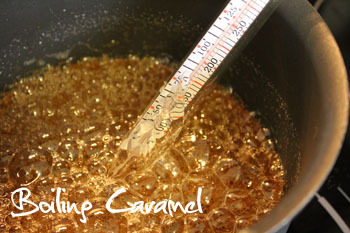 Also, good caramel is a must – make your own if you have to. Safeway brand caramel squares will not cut it. Just trust me on this one. Preheat oven to 350°F. Lightly grease a 9×13 pan. Set aside. Beat sugar and butter in mixing bowl until fluffy. Add egg and vanilla extract. Lower speed and gradually incorporate flour and salt. The mixture should be crumbly. Transfer to pan and press into an even layer with a spatula or large spoon. 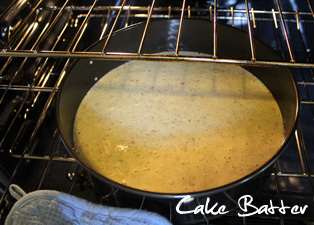 Bake for 20-25 minutes, until base is set and edges are light brown in color. Let cool completely. Preheat oven to 300°F. Line baking sheet with parchment paper. 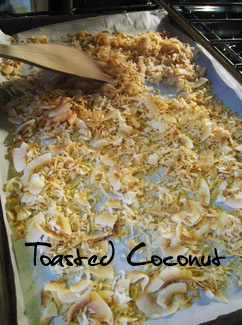 Evenly distribute coconut and toast 20 minutes, stirring every 4-5 minutes, until coconut is golden. Set aside to cool, stirring occasionally. Place (unwrapped, if store purchased) caramels in microwave-safe bowl with milk and salt. Cook on high for 3-4 minutes, stopping to stir every 60 seconds. When smooth, fold in toasted coconut. Using a spatula, spread topping into an even layer over the cookie base. Let set until completely cool. Cut into bars with a large knife or a pizza cutter. 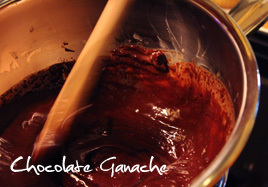 Melt chocolate in a small bowl over a pan of boiling water. Transfer chocolate into a piping or ziploc bag with the corner snipped off and drizzle bars with chocolate OR dip the bottom of each bar into the chocolate and place onto a clean piece of parchment paper. If you choose option two, take the remaining chocolate and decorate the top of the bars. Finally, Girl Scout cookies minus the scout. Seattle is often called a “city of neighborhoods.” **If you’re not familiar with Seattle, check out this neighborhood poster by Ork Posters. ** Each informal district is distinct in look and feel and residents tend to gravitate toward areas that fit their personality (or pocket book). So why did we choose Ballard? Ballard is a Scandinavian neighborhood. Originally a separate city, Ballard was annexed in 1907. Lutefisk and Aebleskiver, however, are still available at the corner market and Danish, Finnish, Icelandic, Norwegian and Swedish flags and wind socks hang proudly from homes throughout the area. Ballard is steeped in history (and often in celebration of it, like the Norwegian 17 May celebration and “Get Your Viking On” Seafood Fest) and progressive (with efforts like Sustainable Ballard‘s “Undriving License” program). Residents enjoy all of the amenities of a small town – making it very walkable – while still being close to downtown Seattle. And the views! The Olympic Mountains, Puget Sound and the Hiram M. Chittenden Locks can be viewed from most parks, main boulevards, and (for the lucky) from home. While I enjoy many of Seattle’s neighborhoods, Ballard feels like home – and I’m not even Scandinavian! 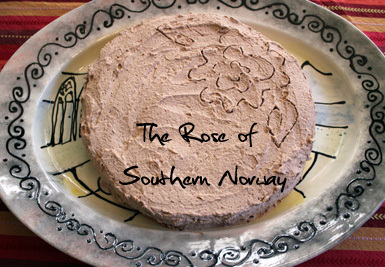 So today, in honor of Syttende Mai, we are making “the rose of Southern Norway,” a recipe from Norwegian National Recipes: An Inspiring Journey in the Culinary History of Norway by Arne Brimi & Ardis Kaspersen. 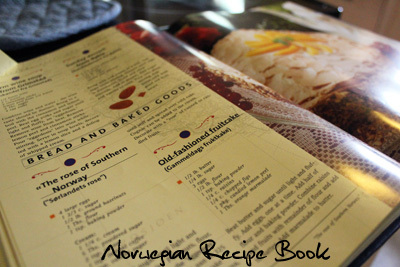 I found our copy of the book when Olsen’s Scandinavian Foods, a staple on Market St since 1960, closed. It was a sad day for Ballard residents, but finding this gem of a book has made it all worthwhile. The pages have yellowed but this edition was clearly loved – favorite recipes are dog-eared and marked with special notes from whom I will never know. So thank you, previous owner, for leaving your copy at Olsen’s and for bookmarking this recipe! Grease 9 (or 10) inch springform pan and pre-heat oven to 325°F. Beat eggs and sugar until light and fluffy (8-10 minutes or until it starts to look something like eggnog pudding). Fold in nuts, flour, and baking powder. Pour mixture into springform pan and bake for 45 minutes, or until a toothpick inserted in the center comes out clean. Leave to cool for 1-2 hours. Combine ingredients in mixing bowl and whip until stiff. Spread over cold cake. The original suggests adding cognac to the frosting for an extra kick. Finally, decorate the cake with a “rose” of canned or candied fruits and serve. Or do what I did and draw one in the frosting instead. Hurra for Syttende Mai! Our first guest cook, aka cousin Lindsey, joined me in the kitchen this week with one request – chocolate! After flipping through a few magazines and scanning my favorite blogs, we saw this Chocolate Caramel Tart on Lottie + Doof and decided we just had to make it. I mean come on, look at those pictures! To be honest, the idea of making caramel scared me a bit, but it’s not as difficult as you might think. Much easier than making marshmallows. And in the interest of transparency, I purchased a chocolate pie crust since we were pinched for time – don’t judge. Place water, sugar, and corn syrup in a large saucepan. Cook over medium-high heat, stirring occasionally, until it becomes dark amber in color (if you’re using a candy thermometer, bring to 350°F). Remove pan from heat and very carefully add heavy cream (the mixture will bubble and may even splatter). Once incorporated, add the butter and crème fraîche and stir until smooth. 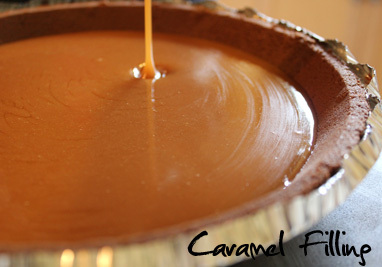 Pour caramel filling into pie crust and allow to set, first at room temperature (10-20 minutes) and then in the refrigerator (at least 30 minutes). Place chocolate in a heat-proof bowl. Meanwhile, bring cream to a boil in a small sauce pan. Pour hot cream over the chocolate and leave for 2 minutes, then stir until smooth. 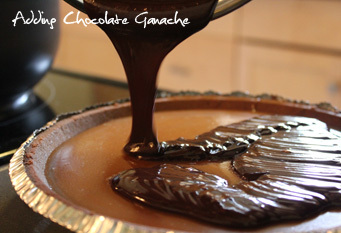 Spread ganache over the tart and return to the fridge until set. Remove tart from the refrigerator 5-10 minutes before serving. Cut into slices and sprinkle each with sea salt. Enjoy! This tart is delicious, though a bit on the sweet side – I gulped down an entire glass of milk within the first few bites. Next time, I would like to spread a layer of toasted walnuts in the bottom of pie crust before pouring the caramel filling in. 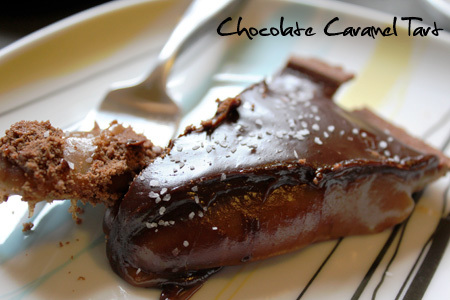 A little extra crunch and extra depth would really put this dessert over the edge. Plus I love the idea of a Turtle Tart! So, what did you think of the tart? One of my favorite restaurants in Ballard is Señor Moose Café on Leary Ave NW. 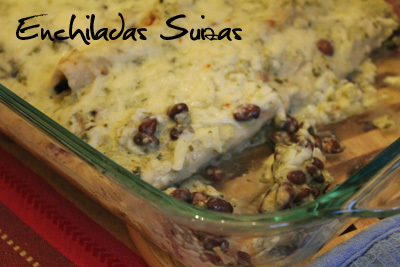 They serve a mean Enchiladas Suizas and I’ve been searching for a home-made substitute ever since my first bite. This is the best recipe I’ve found yet (thanks to Epicurious!) and it’s easier than I ever imagined. I should note that I’ve substituted black beans for chicken, but both options are fantastic. So what are you waiting for? Dig in! 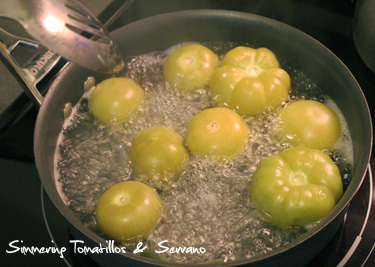 Place tomatillos and chile in a saucepan and cover with water. Boil over medium-high heat for 8 minutes. Drain, reserving 1/2 cup liquid. Note: For a milder dish, take a moment and scrape the seeds from the serrano and discard – you’ll thank me later. Transfer tomatillos and chile to a blender or food processor. Add garlic and cilantro and blend until smooth, adding liquid if necessary. Heat oil in a small saucepan (I rinse and reuse the same pan from earlier) over medium-high heat. 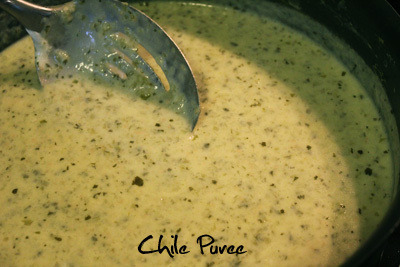 Add tomatillo-chile puree and reduce to medium heat. Simmer, stirring constantly, for 10 minutes. Remove from heat and add salt and sour cream. Stir about 1 minute and set aside. Heat oven to 350°F. Spread 1/3 sauce in a 9″ baking dish. Divide black beans evenly among tortillas, sprinkle with cheese, and roll up. 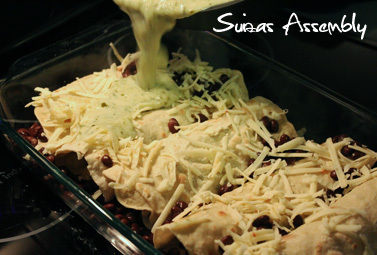 Arrange enchiladas in 1 layer with the seam down. Cover with the rest of the sauce and sprinkle with cheese. Bake 25-30 minutes or until cheese starts to brown. Serve immediately. I didn’t start making my own tortillas until I moved to Germany. It was more or less out of sheer necessity. 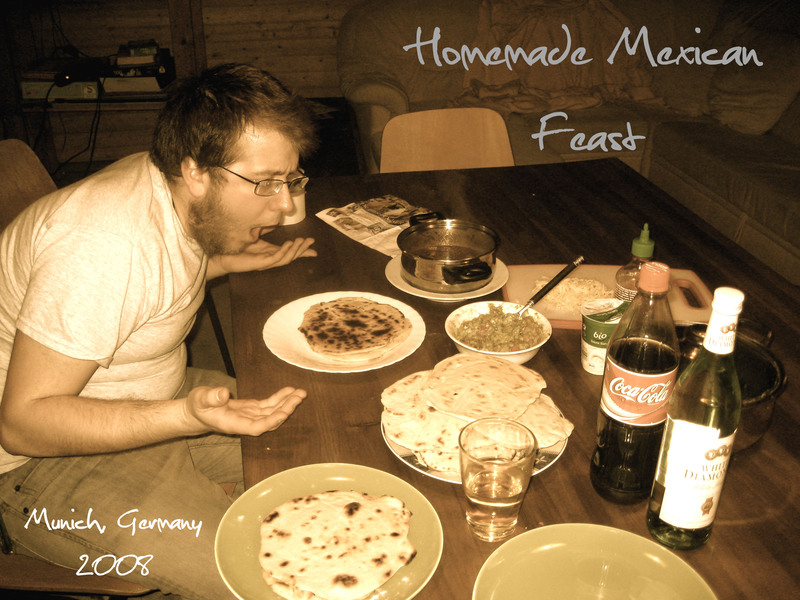 You see, Germans don’t really cook or eat Mexican food. One of my best friends in Munich, Peteski, hails from Texas. This recipe comes from Peteski, and every time I make a batch I am taken back to the funky 1950s WWII era student dorms that we resided in. During our 9-week break between winter and summer semesters, we decided we NEEDED a Mexican feast. We spent a few hours scouring German grocery stores for all the ingredients we needed. We were able to find black beans and hot sauce at an Asian market and avocados, onions, tomatoes, and garlic at our regular stomping grounds, Marktkauf. We spent all day soaking black beans, making tortillas and guacamole. Everything came together beautifully and we were beside ourselves with joy. The best part of the meal? Teaching some of my floor mates how to make a burrito. I’ve never seen such confusion; Germans are all about rules and efficiency, not to say that is a bad thing, but it was difficult for them to grasp the idea of making a burrito with any of the ingredients that they wanted. I’d say it was successful for all parties involved. >> Mix together the flour and the salt in a medium bowl. >> Add the water slowly to the dry ingredients, mixing as you go, until the dough is soft and no longer sticky. Remember, you can adjust the amount of flour and water if need be. More flour if it’s too sticky for example. 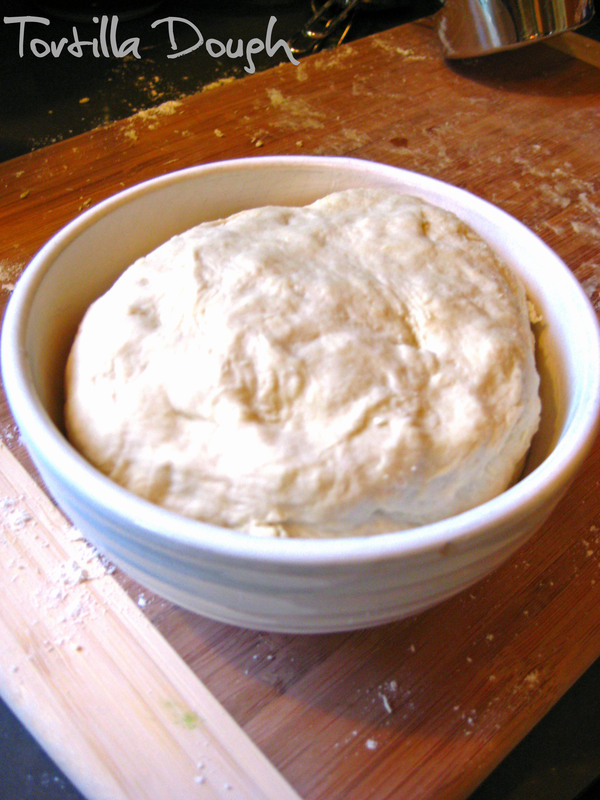 >> Knead the dough until smooth. Place in a pre-olive oiled bowl and allow to rest for a little while. No exact time, just enough to rest. >> Separate dough into golf ball sized balls. >> Lightly flour a surface and rolling pin to roll out the tortillas on, either a big cutting board or counter top. >> Roll out the balls until they are fairly thin. >> Heat up a pan on medium heat. The first couple of tortillas will take a little longer to cook than the rest when the pan is fully heated. 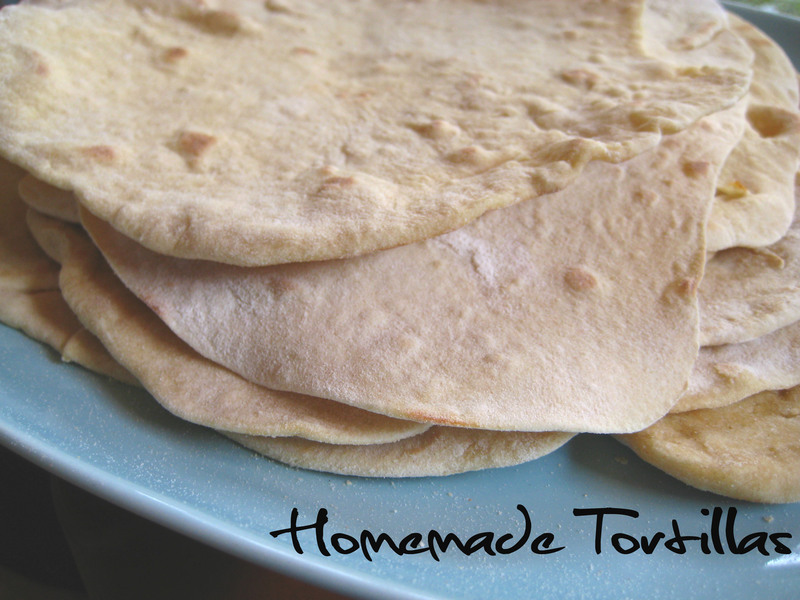 >> Cook tortillas for a minute or two on each side, just until you have some brown spots. You can store tortillas in a Ziploc bag in the refrigerator for a few days. They make delicious burritos, quesadillas, and you can even cut into triangles and bake to make your own tortilla chips. I can’t say that I enjoy holidays, generally speaking. I’m not one to decorate or send out cards. Sometimes I forget they’re even coming up and it isn’t until someone reminds me to purchase a gift or call my family that I realize my mistake. That has never been the case with May Day. May Day is my favorite day of the year. It’s even better than my birthday. As a child my mother would let us pluck flowers out of the garden. We would arrange them in plastic cups, baskets, or vases and leave them on our neighbor’s doorsteps (we would ring the bell and run away – if caught, we had to give the recipient a kiss). It’s a practice that I continued through high school, college, and now into my adult life. None of my friends have escaped the tradition and many have joined me in the game at least once. 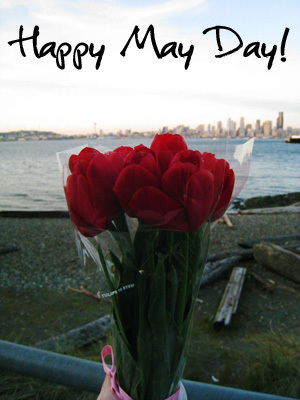 What’s more, no matter how far apart, many of my college friends still contact me each May 1st to wish me a happy day. It really is the best holiday around. I try not to go grocery shopping or flip through the latest issue of Bon Appétit when I’m hungry (though when am I not hungry, really?). N, however, has taken to borderline torturing me as of late with the most delicious cupcake pictures just before dinner. It sends me into sugar cravings like you wouldn’t believe. So today we decided to stop looking at pictures (okay – maybe just a few) and make some cupcakes of our own. The most difficult part was choosing what to make. 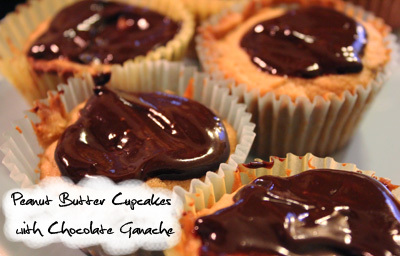 We settled on Peanut Butter Cupcakes with Chocolate Ganache – a slightly revised version of a recipe from Ming Makes Cupcakes. Word to the wise: do not look at this website if you are hungry. Preheat oven to 350°F. Combine the flour, baking powder, salt, and cinnamon in a small bowl and set aside. 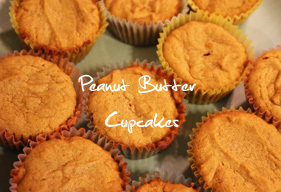 Using a mixer, blend the butter, peanut butter, and brown sugar together. Next, add the vanilla extract and egg. Once incorporated, slowly pour in the milk and flour mixture while still mixing. Add extra milk by the tbs if too dry. Scoop (since this is a peanut butter batter it may be too thick to pour… not to worry) the batter into your pre-lined cupcake pan. 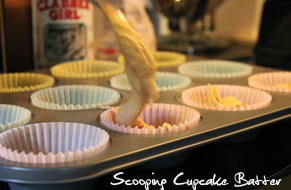 Fill each cup about halfway and put in the oven for 18-20 minutes (or until a test toothpick inserted in the middle of a cupcake comes out clean). Set aside to cool. Melt chocolate and whipping cream together in a metal bowl over simmering water. Drizzle over cupcakes and enjoy!